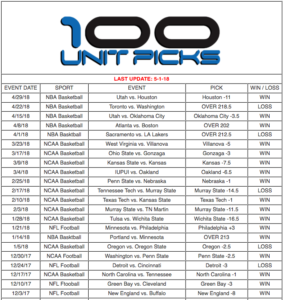 Welcome to 100 Unit Picks. Home of the guaranteed to win 100 Unit Pick where we only need one winner a week. Yes, you read that correct, you will only get one winner per week and it will be a big one and best of all we put a money back guarantee on our big winner! If your looking for a service who will load you up on one easy winner a week that you can bang your book for real big then we are just what you are looking for. But if your looking for a sports service who will load you up on games and keep you busy every single day then this sports service is not the one for you. We don’t mess around giving 3,5,7 or 10 plays per day let alone per week. We just don’t do it. So here is the deal, We have 1 big winner each week. Our records speak for themselves. We know we can’t be 100%, there is nobody who can. 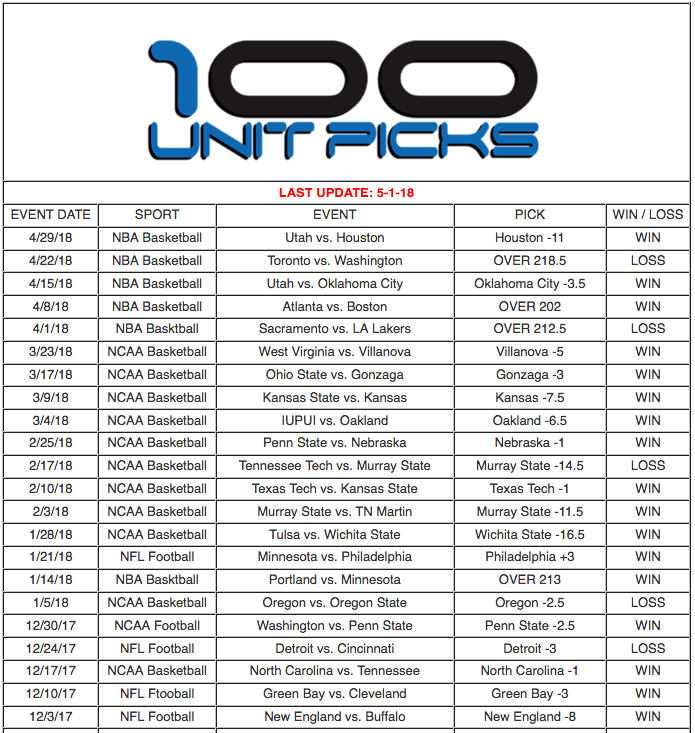 However we are very confident in our 100 Unit Picks that we only need 1 winner per week. We are so confident in our pick that we put a money back guarantee on it. If we don’t win, you don’t pay. It is really that simple. Yes, you are reading that correct, if we don’t win you receive a full refund no questions asked. We don’t offer next weeks game in exchange for a refund, we give you your money back in full and we refund the money the same day if we lose. But I will be honest, please check our records, we don’t lose often! We have won 13 of our last 16 Weekly Winners!